I am having a Solo Exhibit with 34 of my paintings at the Stony Ford Golf Course Clubhouse. Viewing hours are daily from 7am-7pm. Monday – Friday 1-6pm and Saturday and Sunday 1-5pm. The exhibition will be closed on Wednesday, May 15 and Saturday, May 18, for special events. April 1 – 28, 2019. A reception was held on Saturday, April 6 from 5-7pm. Gallery Hours are Monday-Saturday, 12-5pm. May 1 – 30, 2019. A reception will be held on Saturday, May 4 from 5-7pm. Sunday, May 19 from 1 – 3:30pm. from June 14 – July 25, 2019 at the Brotherhood Winery. A closing reception will be held on Thursday, July 25 from 6-8pm. The Winery is open Sunday-Thursday 11am-5pm, Friday 11am-6pm, and Saturday 11am-7pm. Friday, September 20, 2019 at 8pm at Limoncello Restaurant at 159-167, Main St, Goshen, NY 10924. The format will be a silent auction. I will be one of the artists displaying my work in Art in the Park 2019 in the historic downtown Orange Square in Port Jervis on Saturday, June 15, 2019 from 10am-4pm. The rain date is Sunday, June 16 from 10am-4pm. The exhibition is presented by the Port Jervis Tourism Board in conjunction with the River Valley Artists Guild and funded in part by the Orange County Arts Council Community Arts Grant Program. from February 15 – March 15, 2019. I enjoyed showing a painting in the 2019 Annual Members Show at the Wallkill River School on display from January 5 – 31, 2019. A reception was held on Saturday, January 12 from 5-7pm. Gallery Hours are Monday-Saturday, 12-6pm. 2018 Catholic Charities Goshen Christmas House Tour on Saturday, December 1, 2018 from 1-5pm. and Saturday and Sunday 1-5pm. Saturday, December 8 from 5-7pm. Gallery Hours are Monday-Saturday, 12-6pm. Saturday, December 15 and Sunday, December 16, 2018. A reception was on Saturday from 10am-12pm. The exhibit was open 10am-4pm both days. I enjoyed exhibiting paintings in an Art Expo and Sale at the Mohonk Mountain House. The Mohonk Mountain House was holding Community Days from Wednesday, December 12 – Friday, December 14, 2018 when admission to the hotel was free. Mention Community Days at the gatehouse and come check out the exhibit and beautiful Mohonk Mountain House. Viewing hours were 10am – 6pm. The exhibit was presented by Wired Gallery. 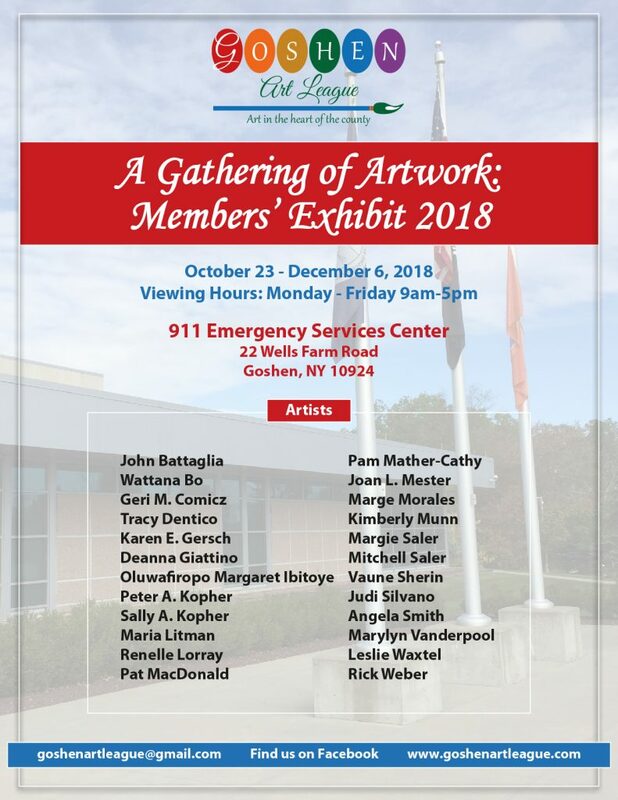 I enjoyed showing a painting in the Goshen Art League’s show, A Gathering of Artwork: Members’ Exhibit 2018, at the 911 Emergency Services Center. The show was on display from October 23 – December 6, 2018. For 2018, I am exhibiting a painting in the Wallkill River School Hallway Rotating Exhibits. I enjoyed having a solo exhibit, Landscape Paintings of New York, at the Sam’s Point Visitor Center as the prize for winning First Place in the Plein Air Paint Out at the Sam’s Point Park Preserve. The show presented around 20 of my realistic oil paintings depicting scenes of nature in the state of New York. The works were on view and for sale from October 1 – 31, 2018. A reception was held Saturday, October 6 from 3-5pm. The park has a $10 per vehicle parking fee. On the day of the reception if the parking lot is full, you could tell the ranger at the gate that you were there for the exhibit and would be directed to a special parking area. The exhibit was open for viewing Monday – Friday 9am-5pm and Saturday and Sunday 9am-6pm. Minnewaska State Park Preserve and the Wallkill River School. The Town of Monroe hosted a Community Day at O&R Lake Park on Saturday, October 20 2018, and I was one of the artists displaying my original artworks for sale and set up plein air painting a scene of the park at this event. There was alsofood and music. The Monroe Art Society organized the paint out and exhibit. from Friday, October 19 through Sunday, October 21, 2018. Viewing hours were 10am – 6pm. Friday September 21, 2018 at 6pm at Limoncello Restaurant at 159-167, Main St, Goshen, NY 10924. The format was a silent auction, and the bidding closed at 7:30pm sharp. The horses were officially unveiled at the Harness Racing Museum & Hall of Fame at 240 Main Street Goshen, NY 10924 on Monday, June 18, 2018 at 6pm. Plein Air artists were demonstrating around Crane Park Pond in Monroe, NY near the downtown area in the Founders Day Paintout during the Founders Day Event on Saturday, September 15 from 10-1pm. I had around 10 paintings on display and for sale along with other artists’ works at the big Gazebo in the middle of the Goosepond near Lakes Road until around 5pm. I was participating in the event with Shawn Dell Joyce, Mary Sealfon, Marylyn Vanderpool, Minjin Kung, Sal Russo, Chrissy Pahucki, and Susan Roth. Thursday, September 6, 2018 from 5 – 8pm at The Chateau in Kingston, NY. General admission tickets could be preordered at fallforart.org or purchased at the door. Saturday, August 4 from 5-7pm. Salmagundi Club 40th Open Annual Non-Members’ Exhibition on display from July 23, 2018 – August 3, 2018. Gallery Hours are Monday – Friday 1-6pm and Saturday and Sunday 1-5pm. A reception was held on closing night on Friday, August 3 from 6-9pm. I enjoyed exhibiting paintings in an art expo and sale at the Mohonk Mountain House from Friday, July 27 through Sunday, July 29, 2018. Viewing hours were 10am – 6pm. The exhibit was presented by Wired Gallery. from June 12 – July 24, 2018 at the Brotherhood Winery. A closing reception was held on Tuesday, July 24 from 6-8pm. The Winery is open Sunday-Friday 11am-5pm and Saturday 11am-7pm. I enjoyed exhibiting a couple of paintings in North Light: A Painter’s Study at Amity Gallery in Warwick, NY. 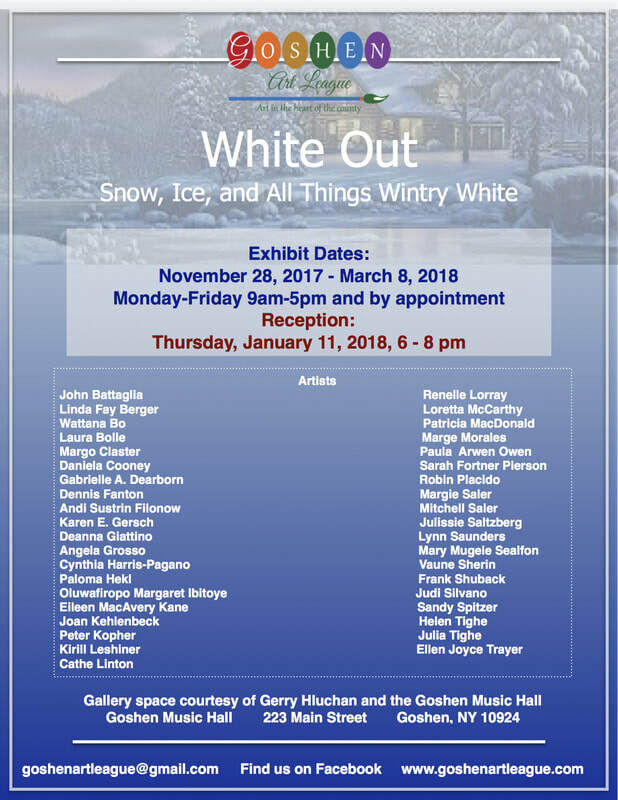 This exhibit curated by Cynthia Harris-Pagano features works inspired by north light and included pieces by Jeannette McGee, Susan Hope Fogel, Mary Mugele Sealfon, Susan Sciarretta, Demetre Bove, Daniel Grant, and renown guest John Phillip Osborne. The exhibit was on display July 7 – July 29 and open weekends from noon-4pm or by appointment. An opening reception was held Saturday, July 7 from 5-7pm. I enjoyed participating in the Bannerman Island Plein Air Paint-Out. A silent auction featuring paintings created on Bannerman Island as well as other Hudson Valley scenes took place at Bannerman Island Gallery, 150 Main Street, Beacon, NY. A Live auction took place in Beacon, NY on Saturday, June 9, 2018 from 4-6pm. I greatly enjoyed being one of the artists displaying my work in Art in the Park 2018 in the historic downtown Orange Square in Port Jervis on Saturday, June 16, 2018 from 10am-4pm. The exhibition was presented by the Port Jervis Tourism Board in conjunction with the River Valley Artists Guild. from May 1-30, 2018. An opening reception was held on Saturday, May 5 from 5-7pm. Orange Hall Gallery at SUNY Orange from May 7 – June 13, 2018. The reception was on Sunday, May 20 from 1 – 3:30pm. At the reception, I was one of the three artists giving demonstrations in the gallery. I enjoyed showing a few paintings in an exhibit featuring works by Wallkill River School Represented Artists at Orange Regional Medical Center from April 27 – May 25, 2018. A reception was on Friday, April 27 from 3-5pm. I enjoyed exhibiting paintings in an art show at the Mohonk Mountain House during Mother’s Day Weekend from Friday, May 11 through Sunday, May 13, 2018. Viewing hours are 10am – 6pm. The exhibit was presented by Wired Gallery. I enjoyed showing two paintings in a juried art exhibit at the Elting Memorial Library in New Paltz on display from April 22 – May 12, 2018. A reception took place on Saturday, April 28, 2018 from 11am – 1pm. The show was being held by the Historic Preservation Commission of the Village of New Paltz in partnership with the Elting Memorial Library. I enjoyed exhibiting paintings in an art show at the Mohonk Mountain House during “Couples’ Romantic Getaway: Spring” weekend from Friday, April 13 through Sunday, April 15, 2018. Viewing hours are 10am – 6pm. The exhibit is presented by Wired Gallery. I enjoyed exhibiting three paintings in Nocturnes, a juried group exhibit at the Wallkill River School. The exhibit was on view March 1 – 30 with a reception on March 10 from 5-7pm that included a painting demonstration by artist Chrissy Pahucki.